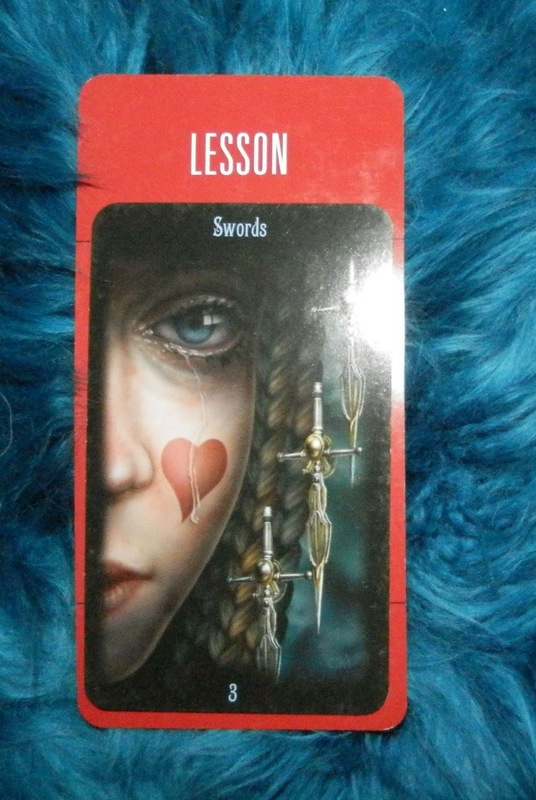 Today's Draw Classic*: Three of Swords in the Lesson position from the Legacy of the Divine by Ciro Marchetti and the Deck of 1000 Spreads by me. When you think on the big lessons in your life, do you remember more of the ones you learned through pain more profoundly? Or do you remember more of the lessons you learned through happy moments more profoundly? Is there something you can learn from that? It's interesting that this combo came up, because I've been thinking lately about the lessons we learn from heartbreak. If you can't tell by the tarot card (and the spectacular way my spread card makes the fractured heart on the cheek pop) that's what this card is about. I often debate the value of the lessons we learn from loss vs. the value of the lessons we learn through victory. I will never misspell the word "committee" ever again because it caused me to lose a spelling bee in third grade. I cried just like the girl in the picture there. Looking back over my life, the most valuable lessons I've learned have been the tough ones. That doesn't mean we don't learn from the good stuff because we do. Doing something right the first time reinforces that behavior or system and so you repeat it to success time and time again. But when that's the case, it just becomes the way you do it....a repeatable process that ends in success. Not so much a lesson you've learned, but something you figured out on your own. But when you learn something the hard way, it becomes somehow more meaningful, more profound. We define it more like a lesson than just a "way". It seems like the higher the price, the more meaningful the lesson, the less likely we are to screw with that particular thing again. Some lessons we just have to learn that way, whether through our own obstinance, lack of awareness or whatever. Can you think of a lesson you learned in the past that you didn't need to learn? Can you think of a painful experience you've ever had that didn't bring lessons? I can't. Pain seems to write on us in ways that both knock us to our knees in tears and then, after time, to our knees in gratitude. It is both toxin and tonic. It poisons and purifies. The universe never brings us something in error. If we're experiencing pain, it's needed on our path. If we're on a winning streak, it's needed on our path. Everything is brought to us in love, as a means to lift us higher. That's sometimes hard to see in the moment, but always visible in retrospect. The hardest lesson of all—the one that causes the most self-inflicted pain—is to learn is to trust in that.